Week after week, more and more people perceive oil hair treatment as one of the most beneficial method of bringing hair back to life. Fairly often natural plant oils appear to be the best godsend for dehydrated, matte, brittle hair with split ends. Hair oil treatment improves condition of hair in a visible way, strengthens and stimulates its roots to more efficient work. Why is oil hair treatment worth applying? It does not matter what type of hair you have – long or short, fair or dark, straight or curly, healthy or damaged, thick or thin. Oil hair treatment is a method that suits each hair type and strands’ condition. All that has to be kept in mind is picking the right oil that will match hair structure. In short, oils used for oil hair treatment differ in terms of fatty acids saturation. Yet, one can be taken for granted, there is at least one oil that meets a particular person’s hair needs. Surely, not once nor twice you were looking at shop shelves wondering why all the hair conditioners are so expensive. This problem does not concern hair oils, because the most popular ones (i.e. linseed, sunflower, coconut or rapeseed oils) can be found in the kitchen. Another widely-used oil, castor oil, can be bought for a few pounds at every chemist’s. Despite pure oils extracted from almost each plant, we can buy also oil preparations that are composed of oil complex. Additionally, such products are enriched with other nourishing substances. Obviously, there are also exotic oils, which are more expensive and cannot be bought in every drugstore. Fortunately, with a little bit of strong will, such a product can be found and bought on the Internet. If we finally decide to undergo oil hair treatment, then we can be sure that all we apply on hair are only natural products. One hundred percent pure, natural oils, that coat hair, lack of damaging silicones, alcohols, parabens, preservatives, artificial fragrances, etc. It is worth being aware of the fact that this feature cannot be true when it comes to oil mixtures or products designed on the basis of plant oils, which are in most cases enriched with other substances. 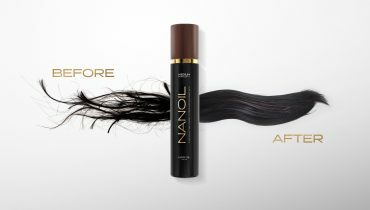 It would not be lie if stated that oil hair treatment is perfect for dealing with any possible hair and scalp problems. Obviously, we will not fix the problem with one oil, yet there is an oily solution for each of the hair trouble. Thanks to adopting appropriate hair oil treatment and applying matching oils, we can strengthen, nourish, regenerate, moisturize, provide gloss and smooth hair. What is more, thanks to such a treatment, we can help our hair become longer, denser and simply more beautiful. Last but not least, oils are also used for hair styling and eliminating such problems like dandruff, hair loss, brittleness, split ends and general deterioration of hair condition.